Incheon: Rower Dushyant Chauhan was the lone bright spot on the fifth day of competitions at the 17th Asian Games in Incheon after the shooters drew a blank as India managed just one bronze medal to slip to the 14th position in overall standings. 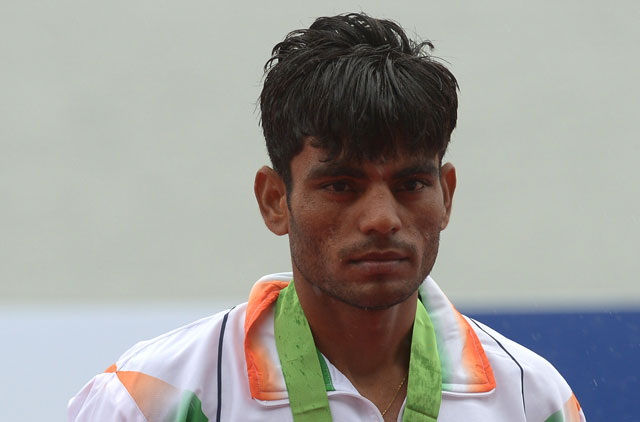 Chauhan was the only athlete to manage a podium finish as he grabbed a bronze in the men’s lightweight single sculls event on what turned out to be a mixed day for the Indian contingent. The strong shooting squad, which had accounted for the bulk of India’s medal tally so far, drew a blank on Wednesday, which led to India dropping one place in the medal table. With the addition of just one bronze today, India took their tally to 12 (one gold, one silver, 10 bronze). Powerhouse China continued to lead the pack with 99 medals (50-25-24) followed by hosts South Korea with 70 medals (24-23-23) and Japan (64 = 18-23-23). The badminton and squash teams had a good day in their respective matches but the women’s hockey team lost 1-2 to China in a preliminary match. Early in the day, Chauhan, hailing from the state of Haryana, led from the 500m until the last 200m in the 2000m race before strong northerly winds and rain put paid to his gold medal hopes as he fell behind two others to finish in a time of 7:26.57. Chauhan trailed eventual gold-medallist Lok Kwan Hai by just under two seconds in the first 500m and then caught up with his rival before overtaking him in the course of the next 500m and looked assured of a gold before inclement weather hampered his chances. He not only lost the gold medal, but also the silver as the host country’s Lee Hakbeom, who was third with 500m left, also surged past the Indian rower to clinch the second spot in 7:25.95. It was the first medal of the day after a fruitless stint at the shooting range for India. After scooping six medals, including a gold won by Jitu Rai, on the first four days of the Asian Games, Indian shooters misfired at the Ongnyeon pistol and rifle range here. India had chances of winning four medals from the 25m rapid fire pistol event for men and the 50m rifle prone for women but could not get even one on a disappointing day. Indian men’s 25m rapid fire pistol team narrowly missed out on a bronze as they finished fourth after ending up with the same points as Vietnam with a tally of 1704. The bronze was decided on ‘innner 10’ count and Vietnam bagged the medal as they had 41 hits at the innermost ring as against 39 by the Indians. India’s chances of a medal in the individual event rested on Harpreet Singh but he failed to even qualify for the final round finishing seventh. Harpreet’s teammates Gurpreet Singh and Pemba Tamang performed poorly to end up 12th and 20th with respective overall tallies of 570 and 556. The Indian women were even more off the mark with army major Raj Chaudhary, the main hope, starting well in the 50m rifle prone individual event before tapering off to finish 22nd out of 43 shooters with an aggregate score of 614.6. Teammates Lajja Goswami (25th; 613.7 points) and Tejaswini Muley (36th; 608.8 points) were totally out of depth. As a result, the Indian women finished outside the medal bracket in the 50m rifle prone team event too, ending up 11th out of 13 countries with an aggregate of 1837.1. Elsewhere, after guiding the women’s badminton team to a historic bronze two days ago, India’s top players Saina Nehwal and P.V. Sindhu opened their campaign in the individual competitions with thumping victories. Sixth seed Nehwal easily overcame U Teng Lok of Macau 21-10, 21-8 in just 20 minutes and lined up against her next opponent Iran’s Soraya Aghaeihajiagha, who dispatched Mongolia’s Khulangoo Baatar in straight games in another round of 32 women’s singles encounter. Sindhu, seeded 8th, too had a comfortable 21-7, 21-13 first round victory in 19 minutes over Wong Kit Leng, also of Macau, to book a round of 16 clash against M Bellaetrix of Indonesia, a contest the lanky Hyderabadi described as “tricky”.